The notion that age and political ideology are related goes back at least to French monarchist statesman François Guizot, who originated the oft-mangled quotation, “Not to be a republican at 20 is proof of want of heart; to be one at 30 is proof of want of head.” But data from the Pew Research Center’s new political typology report indicate that, while different age cohorts do have markedly different profiles, the relationship is considerably more complex than young=liberal and old=conservative. Looking at the youngest American adults, those ages 18 to 29, nearly one-in-five are what we call Young Outsiders — GOP leaners who favor limited government but are socially liberal. Almost exactly the same percentage are what we’ve termed the Next Generation Left, who tilt more to the Democrats but are wary of social-welfare programs. And many (17%) are Bystanders — not registered to vote, don’t follow politics and generally the least politically engaged. That’s the biggest share among all age brackets, though perhaps not entirely surprising. A recent paper by two Columbia University researchers that combined multiple survey data sources finds evidence of this sort of generational imprinting. Their study identified five main generations of presidential voters, each shaped by political events during their formative years: New Deal Democrats, Eisenhower Republicans, Baby Boomers, Reagan Conservatives and Millennials. (The researchers note, however, that their model works best among non-Hispanic whites.) Amanda Cox of The Upshot (The New York Times’ data blog) has created a fascinating interactive visualization of the researchers’ model. Pew Research Center surveys over the past two decades also have found compelling evidence that generations carry with them the imprint of early political experiences. 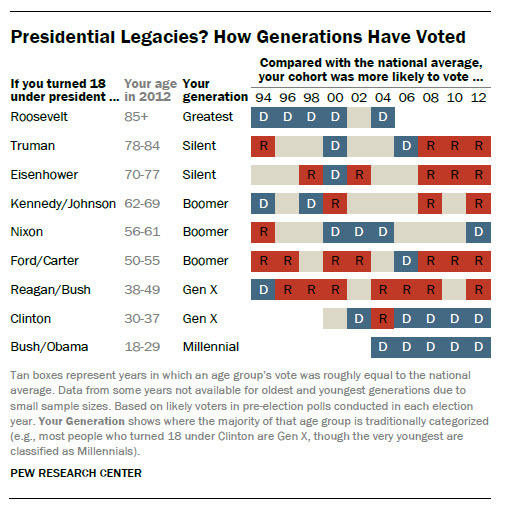 As Fact Tank noted last year, Americans who came of age during the Truman and Eisenhower administrations, and are now in their 70s and 80s, have fairly consistently favored Republican candidates, while those who turned 18 under Bill Clinton and his two successors have almost always voted more Democratic than the nation as a whole.